The fearless OKC Thunder point guard was spotted in the most vibrant Jordan Future yet. What do you make of his look? He might be leading the new Air Jordan flagship model on the game's grandest stage, and yet, OKC Thunder point guard Russell Westbrook's off court wear is certainly just as followed as the sneakers he's wearing on court. 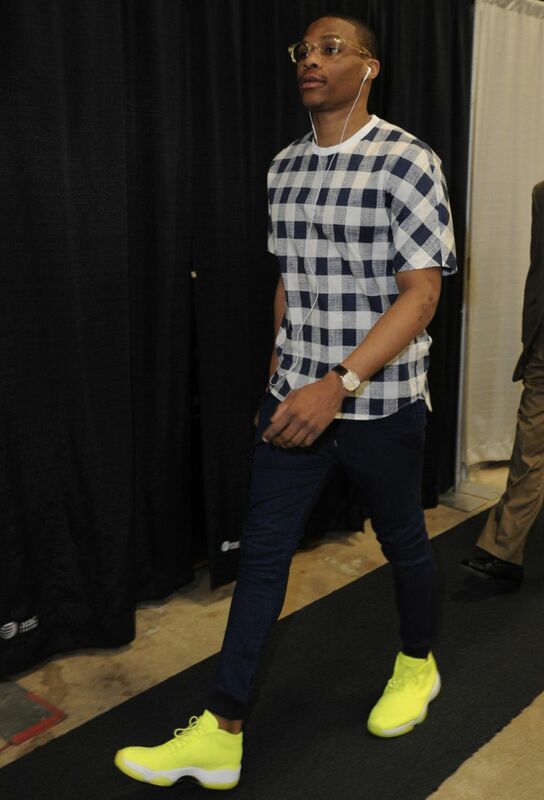 As he was arriving to Game 1 of the Western Conference Finals last night, Westbrook was spotted striding towards the locker room in a gleaming Volt colorway of the Jordan Future, paired with a picnic table cloth plaid shirt and denim leggings joggers. As for the shoes, they were just released over the weekend on Saturday the 17th at select Jordan accounts nationwide for $150. Did you get a pair, do you prefer the other unicolor looks for the model, or are you simply not a fan?